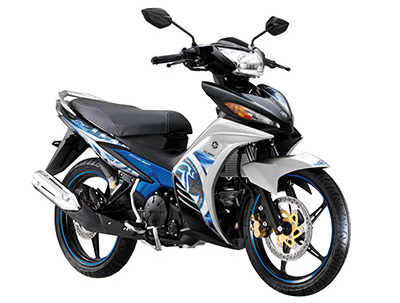 SUNGAI BULOH, 13 November 2013 – Hong Leong Yamaha Motor Sdn Bhd today introduced a new colour range for their best-selling model the Yamaha 135LC. True to the spirit of a leader and a familiar sight on Malaysian roads, this king of the road needs no elaborate introduction, but this 4-stroke liquid-cooled 135cc performance moped has now been pumped up with exciting new colours and graphics together with a new pilot and flasher light design. The Yamaha 135LC is the flagship moped model from the Yamaha range that was first launched in February 2006 with a 135cc liquid cooled engine. The bike comes with proven performance and is equipped with reliable features such as front and rear disc brakes, cast wheels, tubeless tyres, 5-speed transmission, DiASil cylinder, Throttle positioning sensor, a sporty retractable rear footstep, monocross suspension, and stylish speedometer with an anti-theft switch. The new Yamaha 135LC is a statement of power and style that will complement the lifestyle of the young thrill-seekers and trend followers. With the new colour and graphics that are bold, strong and stylish the bike will stand out amongst any crowd. The new Yamaha 135LC comes in the usual variants of auto-clutch “Super Sports” for those who want power and ease of riding and “Extreme Spirit” with clutch, and also for those who want the extra surge of power on tap. Both models come with standard kick-start and electric starters. Sporting striking new graphics with various colours to choose from, the “Super Sports” is available in Red, White and Blue/Black combination whilst the “Extreme Spirit” comes in a choice of Black, Grey and Silver/Blue combo. The new Yamaha 135LC “Extreme Spirit” is priced at RM 6,988 while the “Super Sports” at RM 6,318. These prices exclude registration fees, road tax and insurance and they are available at all authorised Yamaha dealers nation-wide from today.